New Orleans, LA 70112, U.S.A. Increased blood or plasma viscosity has been associated with increased atherogenesis, and that the effects of low-density lipoprotein and high-density lipoprotein on blood viscosity correlate with their association with atherosclerosis risk. Low-density lipoprotein-cholesterol was more strongly correlated with blood viscosity than was total cholesterol (r = 0.4149, P = 0.0281, compared with r = 0.2790, P = 0.1505). High-density lipoprotein-cholesterol levels were inversely associated with blood viscosity (r = – 0.4018, P = 0.0341). To confirm these effects, viscometry was performed on erythrocytes, suspended in saline, which had been incubated in plasma of various low-density lipoprotein/high-density lipoprotein ratios. Viscosity correlated directly with low-density lipoprotein/high-density lipoprotein ratio (n = 23, r = 0.8561, P < 0.01). Low-density lipoprotein receptor occupancy data suggests that these effects on viscosity are mediated by erythrocyte aggregation. These results demonstrate that the effects of low-density lipoprotein and high-density lipoprotein on blood viscosity in healthy subjects may play a role in atherogenesis by modulating the dwell or residence time of atherogenic particles in the vicinity of the endothelium. This discussion is an additional perspective on the series on coagulation, and earlier posts that were on flow dynamics. The direction of the shear stress vector is determined the blood flow velocity vector adjacent to applied against the vessel wall. Friction is the opposing force applied by the wall. Shear stresses are disturbed by turbulent flow, regions of flow recirculation or flow separation. The notions of shear rate and fluid viscosity are crucial for the assessment of shear stress. Shear rate is defined as the rate at which adjacent layers of fluid move with respect to each other, usually expressed as reciprocal seconds. The size of the shear rate gives an indication of the shape of the velocity profile for a given situation. The determination of shear stresses on a surface is based on the fundamental assumption of fluid mechanics, according to which the velocity of fluid upon the surface is zero (no-slip condition). Assuming that the blood is an ideal Newtonian fluid with constant viscosity, the flow is steady and laminar and the vessel is straight, cylindrical and inelastic, which is not the case. Under ideal conditions a parabolic velocity profile could be assumed. Viscosity is a property of a fluid that offers resistance to flow, and it is a measure of the combined effects of adhesion and cohesion. Viscosity increases as temperature decreases. Blood viscosity (non-Newtonian fluid) depends on shear rate, which is determined by blood platelets, red cells, etc. Blood viscosity is slightly affected by shear rate changes at low levels of hematocrit, but as hematocrit increases, the effect of shear rate changes becomes greater. the dependence of blood viscosity on hematocrit is more pronounced in the microcirculation than in larger vessels, due to hematocrit variations observed in small vessels (lumen diameter <100 Ìm). The significant change of hematocrit in relation to vessel diameter is associated with the tendency of red blood cells to travel closer to the centre of the vessels. Thus, the greater the decrease in vessel lumen, the smaller the number of red blood cells that pass through, resulting in a decrease in blood viscosity. Endothelium responds to shear stress depending on the kind and the magnitude of shear stresses. Changes in shear stress magnitude activate cellular proliferation mechanisms as well as vascular remodeling processes. low shear stress induces a reduction in vessel diameter. Shear stresses are maintained at a mean of about 15 dynes/cm2. Blood flow in large arteries is dominated by inertial forces exhibited at high flow velocities, while viscosity is negligible. When the flow velocity is compromised by deceleration at a bifurcation, endothelial cell dysfunction can occur along the outer wall at the bifurcation. In sharp contrast, the flow of blood in micro-vessels is dominated by viscous shear forces since the inertial forces are negligible due to low flow velocities. 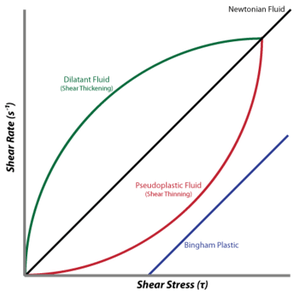 Shear stress is a critical parameter in micro-vascular flow, and a force-balance approach is proposed for determining micro-vascular shear stress. When the attractive forces between erythrocytes are greater than the shear force produced by micro-vascular flow, tissue perfusion itself cannot be sustained. The yield stress parameter is presented as a diagnostic candidate for future clinical research, specifically, as a fluid dynamic biomarker for micro-vascular disorders. The relation between the yield stress and diastolic blood viscosity (DBV) is described using the Casson model for viscosity, from which one may be able determine thresholds of DBV where the risk of microvascular disorders is high. Cho Y-Il, and Cho DJ. Hemorheology and Microvascular Disorders. Korean Circ J 2011; 41:287-295.
increases their propensity to rupture. Ex vivo measurements of whole blood viscosity (WBV) is a predictor of cardiovascular events in apparently both healthy individuals and cardiovascular disease patients. The association of an elevated WBV and incident cardiovascular events remains significant in multivariate models that adjust for major cardiovascular risk factors. These prospective data suggest that measurement of WBV may be valuable as part of routine cardiovascular profiling, thereby potentially useful data for risk stratification and therapeutic interventions. The recent development of a high throughput blood viscometer, which is capable of rapidly performing blood viscosity measurements across 10,000 shear rates using a single blood sample, enables the assessment of blood flow characteristics in different regions of the circulatory system and opens new opportunities for detecting and monitoring cardiovascular diseases. Markers of inflammation, hemostasis, and blood rheology have been ascertained to be risk factors for coronary heart disease and stroke. Their role in peripheral arterial disease (PAD) is not well established and some of them, including the pro-inflammatory cytokine interleukin-6 (IL-6), have not been examined before in prospective epidemiological studies. were significantly (P , 0.01) associated with PAD. having weak associations, were considerably attenuated when accounting for CVD risk factors. complementary ligands expressed on the surface of the endothelium. firm adhesion (primarily mediated by integrins). are the most important molecular properties controlling the dynamics of adhesion. The effect of leukocyte adhesion on blood flow in small vessels is treated as a homogeneous Newtonian fluid is sufficient to explain resistance changes in venular microcirculation. The Casson model represents the effect of red blood cell aggregation and requires the non-Newtonian fluid flow model of resistance changes in small venules. In this model the blood vessel is considered as a circular cylinder and the leukocyte is considered as a truncated spherical protrusion in the inner side of the blood vessel. Numerical simulations demonstrated that for a Casson fluid with hematocrit of 0.4 and flow rate Q = 0:072 nl/s, a single leukocyte increases flow resistance by 5% in a 32 m diameter and 100 m long vessel. For a smaller vessel of 18 m, the flow resistance increases by 15%. (Lipowski et al., 1991, 1996). the progression of heart disease. the magnitude of the force on the bond F.
The rate of formation directly follows from the Boltzmann distribution for affinity. The expression for the binding rate must also incorporate the effect of the relative motion of the two surfaces. Unless firmly adhered to a surface, white blood cells can be effectively modeled as rigid spherical particles. This is consistent with good agreement between bead versus cell in vitro experiments (Chang and Hammer, 2000). where cell mechanics or binding affinities can be correlated with clinical pathologies. Blood viscosity, the metric for the thickness and stickiness of blood, is associated with all major risk factors for cardiovascular disease, complications of diabetes, and it is highly predictive of stroke and MI, as well as cognitive decline. While elevated blood viscosity has a role in the etiology of atherosclerosis, there is strong evidence for a causal role in the development of dementia. It follows that improving blood viscosity should lead to improvements in cognitive as well as cardiovascular function. First to consider is hematocrit. Erythrocyte deformability is the ability of red blood cells to elongate and fold themselves for better hemodynamic flow in large vessels as well as for more efficient passage through capillaries. The more deformable the red blood cells, the less viscous the blood. Young red blood cells are flexible and tend to stiffen over their 120 day life-span. Erythrocyte deformability is, after hematocrit, the second most important determinant of blood viscosity. The third factor is plasma viscosity. An important determinant of plasma viscosity is hydration status, but it is also determined by the presence of high molecular-weight proteins, especially immune globulins and fibrinogen. Erythrocyte aggregation, the tendency of red blood cells to be attracted to each other and stick together is not well understood, but erythrocyte deformability and plasma proteins play important roles. Blood, like most other fluids, is less viscous at higher temperatures. It is estimated that a 1°C increase in temperature results in a 2% decrease in blood viscosity. Maintaining efficient blood flow through the vessels forms layers, or lamina, that slide easily over each other. Slower moving blood in the outer layers near the vessel walls. Hyper-viscous blood doesn’t slide as smoothly as less viscous blood. The turbulence damages the delicate intima of the blood vessel. One of the most common locations for the development of atherosclerotic plaques is at the bifurcation of the carotid arteries, and the positioning of these plaques can be mapped to the turbulent blood flow patterns of this region. Blood viscosity is highly correlated with thickening of the carotid intima-media, a prelude to plaque formation. As the carotid arteries become progressively more occluded, there is decreased blood supply to the brain. Hyper-viscosity also impacts the brain at the level of micro-perfusion. Stiffened red blood cells have a decreased ability to bend and fold as they pass through capillaries. This leads to endothelial abrasion. The capillary walls thicken and diffusion of oxygen and nutrients into the tissues decreases. The effect is most pronounced in those tissues where perfusion is essential for unimpaired function, such as the brain. While diabetics have elevated blood viscosity, blood viscosity is a risk factor that predicts progression from metabolic syndrome to diabetes. Red blood cell flexibility is greatly reduced by fluctuations in the osmolality of the blood which is affected by blood glucose concentration. Uncontrolled, this leads to small vessel disease. develop as these organs are the dependent on micro-perfusion. The Rotterdam Study and other research point to decreased cognitive function and increased dementia among diabetics as being further manifestations of the decreased perfusion that accompanies elevated blood viscosity. Multiple forms of cognitive decline, including dementia and Alzheimers’ are impacted by increased blood viscosity. The Edinburgh Artery Study (2010) showed that blood viscosity predicted cognitive decline over a four year period in 452 elderly subjects (p<0.05). Blood viscosity, an important determinant of the circulatory flow, was significantly linked with cognitive function. The associations between cardiovascular risk factors, vascular dementia, and Alzheimer’s disease were presented by de la Torre (2002) (nine points of evidence) in a compelling argument that Alzheimer’s is a vascular disorder characterized by impaired micro-perfusion to the brain. The most recent technology uses an automated scanning capillary tube viscometer capable of measuring viscosity over the complete range of physiologic values experienced in a cardiac cycle (10,000 shear rates) with a single continuous measurement. This test provides clinicians with measurements of blood viscosity at both systolic and diastolic pressures. Blood viscosity testing is indicated for a wide range of patients, as good tissue perfusion is central to good health regardless of what system is being addressed. Patients with signs of cognitive decline should be high on the list of those appropriate to test, and those patients with a history or family history of heart disease, stroke, hypertension, diabetes, metabolic syndrome, migraines, smoking, alcoholism or other risk factors associated with the development of Alzheimer’s disease. World Health Organization. Dementia: A Public Health Priority. April, 2012. Kensey KR and Cho, Y. Physical Principles and Circulation: Hemodynamics. In: The Origin of Atherosclerosis: What Really Initiates the Inflammatory Process. 2nd Ed. Summersville, WV: SegMedica; 2007:33-50. Sleep Apnea and Blood Viscosity. Obstructive sleep apnea (OSA) is an important public health concern, which affects around 2–4% of the population. Left untreated, it causes a decrease not only in quality of life, but also of life expectancy. Despite the fact that knowledge about the mechanisms of development of cardiovascular disease in patients with OSA is still incomplete, observations confirm a relationship between sleep disordered breathing and the rheological properties of blood. Tażbirek M, Słowińska L, Kawalski M, Pierzchała W. The rheological properties of blood and the risk of cardiovascular disease in patients with obstructive sleep apnea syndrome (OSAS) Folia Histochemica et Cytobiologica 2011; 49(2):206–210. and rheological risk factors may be of major relevance for the incidence and the risk stratification of these patients. Methods: In 243 patients with coronary artery disease and stable angina pectoris parameters of metabolism, hemostasis, blood rheology and endogenous fibrinolysis were assessed. Patients were prospectively followed for 2 years in respect to elective revascularizations and acute coronary syndromes. Results: During follow-up 88 patients presented with cardiac events, 22 of those were admitted to the hospital because of acute events, 5 Patients were excluded due to non- cardiac death. the incidence of acute cardiovascular events (18% vs. 8%, p < 0.01). plasmin-activator-inhibitor (6.11 ± 3.4 vs. 4.7 ± 2.7 U/l, p < 0.05). short-term incidence of cardiac events, especially in patients with diabetes mellitus type 2, and may be used to stratify patients to specific therapies. parameters of metabolism, hemostasis, endogenous fibrinolysis and blood rheology for patients with and without diabetes mellitus. Abnormal hemorheology has been shown to be in almost all conditions associated with accelerated atherosclerotic cardiovascular disorders. The aim of this study is to test the hypothesis that high concentration of plasma Triglyceride (TG) predicts altered hemorheological variables in normal pregnancy. Sixty pregnant women attending antenatal clinic of the University of Ilorin Teaching Hospital at 14-36 weeks of gestation (aged 21-36 years) were recruited after giving informed consent to participate in the study. They consisted of 28 primigravidae and 32 multigravidae. Twenty-four healthy non-pregnant women of similar age and socioeconomical status were also recruited. The study showed that fasting plasma Triglyceride (TG) increased significantly in primigravidae and multigravidae. o hemoglobin concentration (r = 0.85, p<0.001). However, there was an insignificant correlation between TG and the hemorheological variables in multigravidae. Plasma TG concentration in primigravidae is strongly associated with blood viscosity also with hematocrit and hemoglobin concentration, but the association is lost in multigravidae. Therefore, TG could be considered as an important potential indicator of altered blood rheology in primigravidae, but not in multigravidae. Olatunji LA, Soladoye AO, Fawole AA, Jimoh RO and Olatunji VA. Association between Plasma Triglyceride and Hemorheological Variables in Nigerian Primigravidae and Multigravidae. Research Journal of Medical Sciences 2008; 2(3):116-120. ISSN: 1815-9346. Retinal vein occlusion (RVO) is an important cause of permanent visual loss. Hyperviscosity, due to alterations of blood cells and plasma components, may play a role in the pathogenesis of RVO. Aim of this case-control study was to evaluate the possible association between hemorheology and RVO. In 180 RVO patients and in 180 healthy subjects comparable for age and gender we analysed the whole hemorheological profile: [whole blood viscosity (WBV), erythrocyte deformability index (DI), plasma viscosity (PLV), and fibrinogen]. WBV and PLV were measured using a rotational viscosimeter, whereas DI was measured by a microcomputer-assisted filtrometer. WBV at 0.512 sec-1 and 94.5 sec-1 shear rates as well as DI, but not PLV, were significantly different in patients as compared to healthy subjects. the lowest tertile of DI (OR: 0.18, 95%CI 0.10–0.32; p<0.0001) and RVO was found. remained significantly associated with the disease. In conclusion, the data indicate that an alteration of hemorheological parameters may modulate the susceptibility to the RVO. Sofi F, Mannini L, Marcucci R, Bolli P, Sodi A, et al. Role of hemorheological factors in patients with retinal vein occlusion. In Blood Coagulation, Fibrinolysis and Cellular Haemostasis. Thromb Haemost 2007; 98:1215–1219. Summary: This discussion is a two part sequence that first establishes the known strong relationship between blood flow viscosity, shear stress, and plasma triglycerides (VLDL) as risk factors for hemostatic disorders leading to thromboembolic disease, and the association with atherosclerotic disease affecting the heart, the brain (via carotid blood flow), peripheral circulation, the kidneys, and retinopathy as well. It may be better, but few clinical laboratories do ultracentrifugation. Diabetics tend to have Frederickson Class IIb. Fred Class I is uncommon. Laboratories have let the triglycerides rise to the top. The VLDL drives the LDL, but I don’t know what the true “false” negative rate is. I just saw my cardiologist yesterday and he said that now the advantage of measuring LDL particles vs LDL serum level wouldn’t have any effect on his treatment. The key question is given at least more than 6 variables that the physician has to consider – in addition to the laboratory work, how does so and so process the information?